There are brands that I will pay an exorbitant price for- like a hand-woven sweater made by Peruvian women. It’s truly one-of-a-kind. A knockoff just isn’t the same. In day to day life there are times when I’ll opt for the name brand version of a product because I trust it. However, unbeknownst to me, the exact same product (with just a slightly different label) is right next to it on the shelf, for $5 less. Will you sacrifice quality if you switch to the store brand? “Why would name brands do that?" Is most people’s first reaction. Well, it’s because retailers still have leverage. They can go to name brand manufacturers, announce they are bringing in a store brand version of a product, and tell the name brand manufacturer that they can either kiss half of their item’s sales goodbye, or keep all the sales by producing the store brand option in addition to that name brand product. Of course, the retailer gets more of the margin in Scenario B, but the the name brand still makes a little money. A little on those products is still better than none, right? When a name brand manufacturer decides to make the store brand version of a product, it’s likely that two products, sitting side-by-side could be the exact same. In fact, it is sometimes cheaper and more efficient to produce the same product on the same line and just label it differently. This half gets the name brand label, and this half gets the store brand sticker. When the name brand manufacturer says no, they won’t make the store brand, you get a lot more product variation. You might get a terrible copycat, something in-between, or even a really good dupe made by a 3rd party that actually knows what they are doing. It totally varies, but regardless of the quality, it’s always much cheaper. Store brands piggy back on marketing dollars spent by name brands, convincing us that we need a product. All that startup coffee? Crest convinced me - My teeth are definitely yellowing! But I might opt for the cheaper substitute! The name brand has already done the work. For instance, Crest’s ‘If you’re not whitening, you’re yellowing’ Campaign has already convinced you you need to whiten your teeth, now the store brand doesn’t have to. When you pay for the name brand, you’re paying for this marketing, also know as the “brand tax,” as well. The store brand doesn’t have to pay for shelf space or convince retail-buyers that they should get the space. 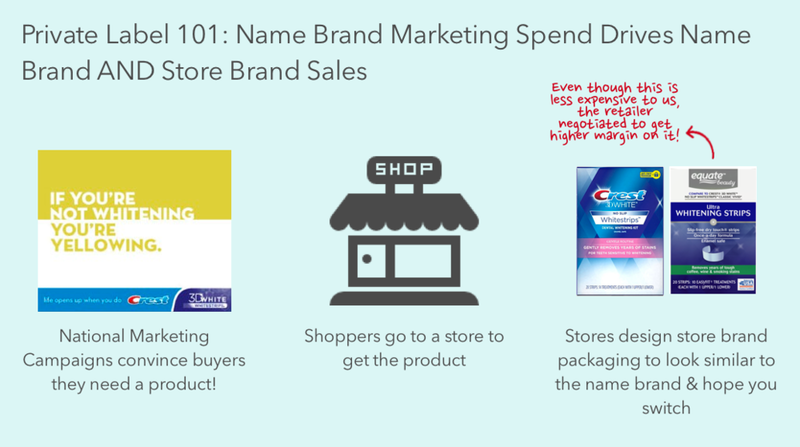 The retail buyer naturally wants the store brand on the shelf, because they are frequently incentivized by a combination of sales and margin, and store brands win on margin every time. In the last few years, there has been a lot of buzz about store brands, as retailers prioritize them as a way to drive loyalty and margins. Just recently, Target launched Smartly, see our review a line that is a no-frills household option. More retailers are focusing on “National Brand Better” products, which aren’t direct copycats to the name brand, like these Sam’s Club makeup wipes. Retailers are trying to be innovative in their own right. Some companies have nailed this, such as Trader Joes. It doesn’t compare directly to anything and it is delicious in its own right. Target Launched their new Smartly line, a no frills household brand that we think is most similar to Method Products. Many retailers mix the “copycat” strategy with a little bit of the “Name Brand Better” strategy, and it can get confusing for the consumer. Amazon is having the same challenge, and though they are in their infancy in terms of private label development, they are one big baby. In fact, Barron’s has them slated to do $25 Billion by 2022 in private labels alone. They are also dancing on the fence of the Copycat and National Brand Better Strategies, in a slightly less explicit way. 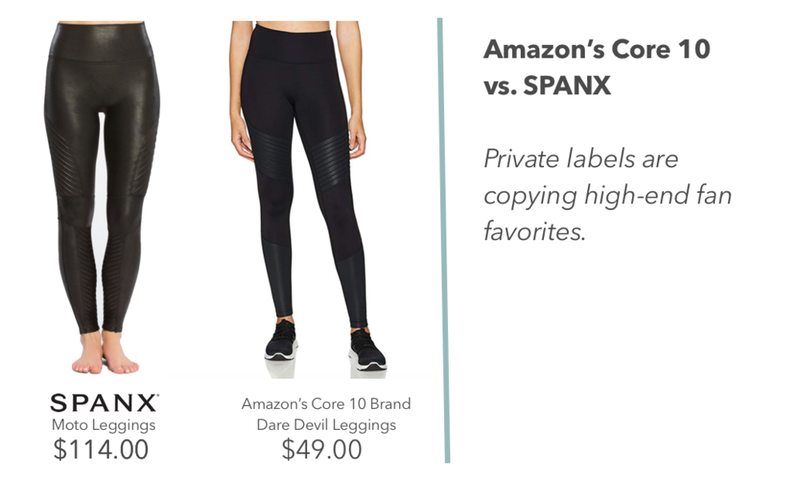 See a resemblance between the Spanx Moto leggings and the Amazon Core 10 Dare Devil leggings? The lack of transparency in the industry led me to start Brandefy, a company 100% focused on finding out how name brands and store brands compare. We physically test products side by side, to tell consumers how similar or how different products are based on smell, taste, ingredients, feel or whatever attributes are relevant to the product. Private Labels aren’t going anywhere, but there’s no reason consumers can’t get more sophisticated. Follow us on social to stay up to date with our latest findings.